On Monday, US Secretary of Defense Ashton Carter, acting on behalf of Obama, awarded Henry Kissinger the Distinguished Public Service Award, the highest award presented by the Pentagon to a private citizen. The list of Kissinger’s human rights & war crimes boggles the mind; the estimates of his victims is in the several millions–including in Chile, Argentina, Vietnam, Cambodia, East Timor, Pakistan just during the Nixon & Ford regimes–& he continued to advise presidents thereafter in several murderous US wars. He reportedly joked & sneered about some of the monstrous crimes he was responsible for. Some consider the toothy-grinned Obama as cool, hip, a regular fellow who’ll morph into a humanitarian when his term is up. 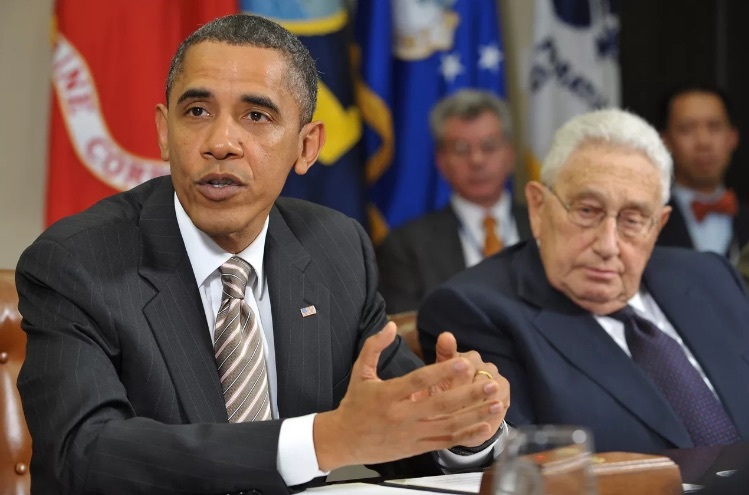 But his association with & honoring of Kissinger (not to mention his several wars) identifies him as a lying-assed scoundrel who merits the condemnation of all men & women of good will. It sends shivers up my spine that many Sanders’ supporters will pull the lesser evil switcheroo & start campaigning for Clinton against Trump. Actually it breaks my heart that anyone calling themselves progressive could vote for such a dishonest, war-mongering candidate with a target on the Palestinians & destroying BDS. The contrast between Drumpf & Clinton dramatizes the treacheries & banalities of lesser evil politics more than anything in endless cycles of the travesty that is US elections. That’s why the majority of eligible US voters don’t bother to register or vote. You can’t fool all the people most of the time. “Politicians who have voted for wars, expanded the carceral state, funded drone programs, cosigned the kill list, bankrolled Israeli ethnic cleansing, impoverished millions (perhaps billions), justified police brutality, trampled women’s rights, destroyed the environment, rescued bankers with taxpayer money, amplified anti-Black racism, deified Wall Street, cheered torture, enacted discriminatory legislation, invigorated xenophobia, privatized public assets, poisoned human beings with toxic water, cossetted dictators, denied the Armenian genocide, warehoused undocumented workers (including children) in overcrowded closets, dispossessed Indigenous peoples, and transformed a religion with over a billion adherents into a progenitor of terrorism are now wringing their hands about the horrors of a potential Trump presidency. And an army of commentators can’t stop warning us about the moral boundaries we’re fixing to cross. Reposting this from last February because it explains the case of Ahmed Manasra, the 14-year-old Palestinian boy convicted in an Israeli kangaroo courtroom on two charges of attempted murder after he allegedly attacked two Israelis with a knife, neither of whom died. His lawyer Lea Tsemel says young Manasra faces up to twenty years in prison but is of course planning to appeal the decision. This verdict for attempted murder by a young boy contrasts grotesquely with the manslaughter charge against Israeli soldier Elor Azarya who was filmed executing a fallen Palestinian man in Hebron, West Bank. Thousands of Israelis rallied in Tel Aviv to support Azarya & calling for death to Palestinians. The petition cited in the post is still operative so please take a moment to sign it to protest this outrageous flouting of justice. It appeared to be progress when US states closed down those institutions in the late 1960s-70s but they did not provide alternative social services like housing, counseling, advocates, & many ended up homeless. It was a new day rising when those with disabilities began to organize themselves politically in the 1970s to demand equal rights & the end of flagrant discrimination, marginalization & social isolation in every aspect of life. There were frequent photos of protesters in wheelchairs during the Arab uprisings, during the Greek austerity protests, in the Occupy movement protests–all fighting as peers. There are frequent photos of refugees disembarking from dinghies in Greece on wheelchairs & joining other refugees in rushing the border fence between Greece & Macedonia. They also are engaged in battles with their own governments to provide social services & social security still denied them–not to mention destroying the popular & institutional prejudices against them as inferior human beings. Several times, most recently two weeks ago, disability activists on crutches & in wheelchairs in Bolivia marched on the capital to demand an increase in their paltry social security benefits. 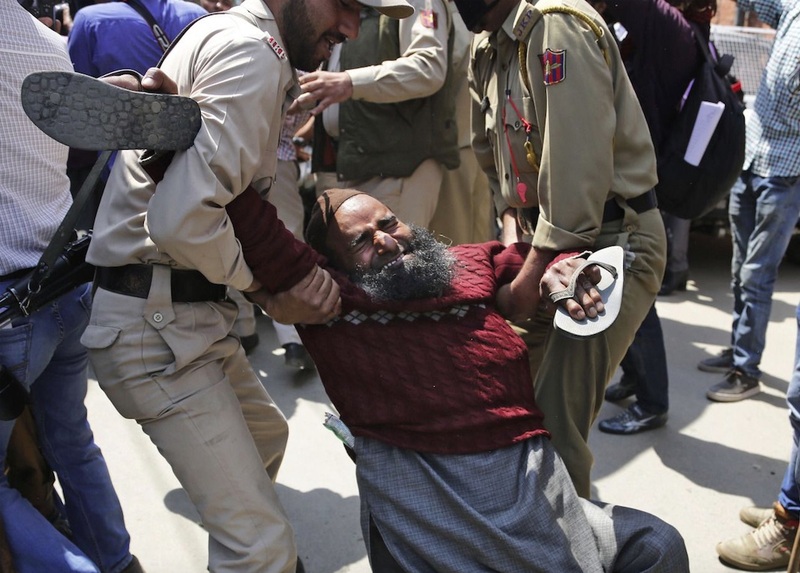 This photo is an activist of the Jammu & Kashmir Handicapped Association being arrested by Indian police at a protest for disability rights in Srinagar. Media reports that over a dozen activists were arrested, some of them on crutches or in wheelchairs. The activists, marching behind a banner reading “We want justice, we want rights,” were demanding the reservation of government & private jobs, concessions on electricity & water bills, subsidies on loans, & social security of 6,000 Indian rupees (around $90) each month. India does not have social security so that demand is extremely avant-garde & strengthens the political struggles within India proper for social security. Because of so many barbarous wars, disability rights has become a central issue in politics–& not just for the veterans who fight them: hundreds of thousands of people in Gaza, Iraq, Afghanistan, Pakistan, Kashmir, & elsewhere have been disabled. There is an ideology behind denying those with disabilities full stature in social & political life. It’s the same genre as racism, misogyny, & supremacist views of all kinds. The historic mission of humanity is to overcome such rancid impediments & make this world suitable for all human beings to live in.